Sooooo.... Can I make a request for the items I need the textures for? The other item I need help with is the clock, in keeping with the theme of the pack being based on a character who's both insane and possesses a rather extremely childish mindset, I want to make the clock look as though the character grabbed some crayons, drew on the casing, and then proceeded to put a smile on the sun and moon. I am terribly sorry, but this request is too hard for me. Due to the update of minecraft textures, I would have to edit each little part of the clock's animation. Style*: I would prefer it to look Somewhat like the ingredients used to make it. I need a 16x16 of this block because currently the only one I have is 32x32 and some people Don't like higher res textures. Thank you for your time. If I like it I will donate a buck or 2 for your time! My lord! I completely forgot about your request! My apologies. Anyway, here's your texture. Ask if you would like anything changed! can I get a different texture that would go with this, I want the texture for the front and sides to be different. Like a furnace, This picture will probably be the sides. For the front I would like it to look somewhat as if you could insert a bottle into it? just like a bottle shaped hole in the front of it basically. thanks! Thank you, By the way did you get my donation? My gosh, I'm so sorry! I've been a bit busy these past couple of days. Hoodoo, I'll be sure to have yours by tomorrow, and Toby's no later than the day after! Quick question, do you want all of the sandstone textures? I think I'll just restart on this. Also, what would you do to the texture if you were to edit it? Can I have coloured wood's, all the colours of the wools in a different wood ? Just to clarify - you are talking about the default textures, correct? Just the regular sandstone. If I edit, it's to adapt to the pack, so it may be various things, mostly to make it smoother and detailled. But if it looks natural AND buildable, the design should be the same. You still have credit. Alright, so basically I'm just making a base texture for you? In the case the texture you make has a different style from my pack, yes. Okay. So, ignoring the shading on the sandstone, how's the overall layout of it? Alright, I've got two for you. 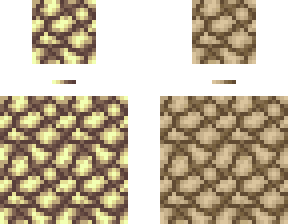 One, i *tried* to hue shift the colors, it turned out like glowstone. The other is just with the original colors. Do you do only blocks? I have a few mobs I want to retouch for a personal resource pack. It IS 'Request a Block' so I think not. Although items he may do.